In just a few weeks, Major League Baseball will host its annual FanFest extravaganza in conjunction with the 2010 All-Star Game to be played in Anaheim, California. Billed by MLB as an “interactive baseball theme park and the largest baseball fan event in the world,” FanFest offers a host of unique attractions that will be showcased from July 9th to July 13th. The price of admission will grant visitors access to video batting cages, exhibits from the Baseball Hall of Fame, a “Steal Home Challenge,” and even a live auction of vintage treasures of the game. Last years FanFest auction in St. Louis featured an offering of a “cache of 19th century letters” written to Harry Wright, the “Father of Professional Baseball,” but the FBI stepped in and the auctioneer stopped the sale after it was confirmed that at least some of the letters were stolen from the New York Public Library’s Harry Wright Correspondence Collection. Now it has been revealed by Haulsofshame.com that in 1998, MLB vendor, Hunt Auctions of Exton, PA, unknowingly and unintentionally sold off part of the stolen last will and testament of Harry Wright. 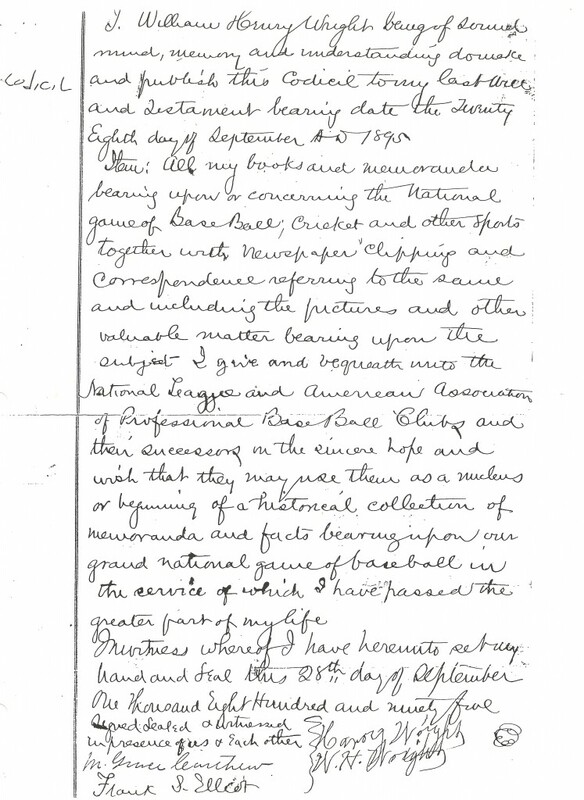 This was the very document written in 1895 that stated Wright’s last wishes that his baseball archive be left to the National League to establish “the beginning of a historical collection of…our grand national game of baseball.” Wright’s collection had been preserved by former National League president A. G. Spalding and it was donated to the New York Public Library by Spalding’s widow in 1921. 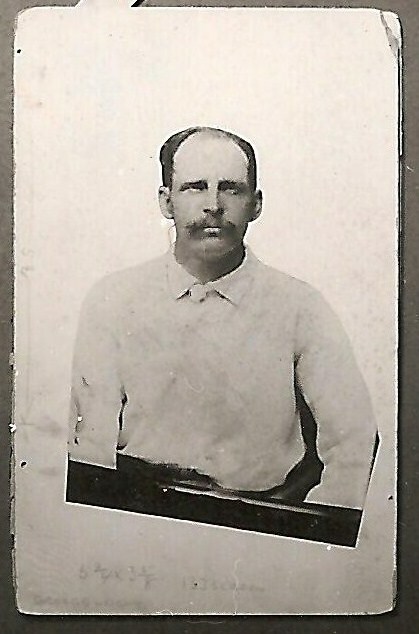 In 1998 an FBI investigation led to the conviction of a Boston court clerk, Joe Schnabel, who admitted to stealing wills signed by several Baseball Hall of Famers including Hugh Duffy, George Wright and “Old Hoss” Radbourn. The will of Harry Wright was likely part of the Schnabel thefts, but it is unclear if Schnabel ever confessed to having stolen it. The codicil to Wright’s will was sold by Hunt Auctions in February 1998. The conviction of Suffolk County court officer Joe Schnabel led to the recovery of many stolen wills but it appears that several documents from other courthouses, including that of Harry Wright, were never returned even though the story of the thefts made national news. It is believed that the wills of many other players including Jackie Robinson may still be among the missing. 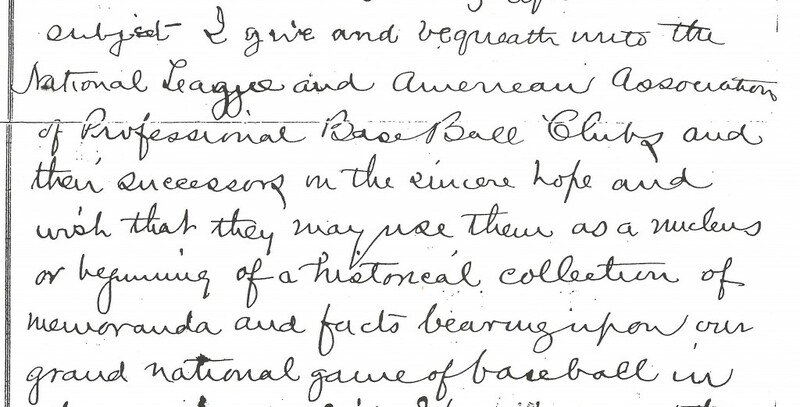 Close up of Harry Wright's Instructions to Bequeath his Baseball Archive to the National League. By May of 1999, Boston Court officer Joe Schnabel plead guilty to the thefts of baseball player wills and the same news organizations published articles detailing the facts of the Schnabel plea, which included descriptions of other wills still missing from the Boston probate court, including the will of Baseball Hall of Famer Tommy McCarthy. When Hunt Auctions president, David Hunt, was first interviewed by The New York Times in regard to the 2009 sale of Wright’s letters he vehemently supported his consignor stating he had not seen “one piece of evidence” that suggested the letters were stolen. 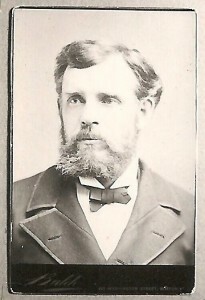 However, when evidence surfaced indicating that one of the letters was stolen, Hunt withdrew all of the Wright letters from the auction. At the time of the withdrawals, Hunt issued a statement to the Times detailing how the auction house was “working closely with the FBI throughout the investigative process.” Now, close to a year after the auction, the FBI is in possession of all of the Wright letters. Additional research unearthed in Cornell University’s “Seymour Papers Collection” has confirmed that most of the letters offered at the 2009 auction were, in fact, stolen from the New York Public Library. Harry Wright helped create the organization today known as Major League Baseball, and he also entrusted the organization to safeguard his historic baseball archive. Now, over a century after Wright dictated his final wishes, Major League Baseball has been unintentionally associated with the illegitimate sale of Wright’s legacy. MLB’s association with a company involved in the shady world of baseball collectibles is troubling for one of Wright’s relatives. Based upon MLB’s statement detailing the auction process and noting the fact that the offerings of Wright’s will and his letters were separated by twelve years time, it is reasonable to view both Hunt Auctions and MLB as victims of circumstance. Hunt Auctions, by no fault of their own, simply accepted two consignments that ended up having checkered pasts and links to Harry Wright’s donation of his archive. The real culprits in this improbable scenario are the thieves who originally pilfered Harry Wright’s letters and will. Investigations conducted by Haulsofshame.com also confirm that many of the owners of stolen baseball items are good faith buyers and sellers who could also be considered victims of the original thefts. Although the theft of Harry Wright’s will has been reported to the authorities, it appears that no formal investigation has yet been opened. The Philadelphia Probate Court’s Chief Deputy Ralph Wynder confirmed that he has not yet been contacted by either local law enforcement or the FBI. “No one has called our office to help recover the Harry Wright will,” said Wynder. That source may be right. Over a month ago it was reported that another stolen, will-related, document signed by Harry Wright’s brother, George (also a Hall-of-Famer), was being sold on the website of Quality Autographs of Virginia for $6,500. Even though it was reported to the authorities and the Boston Probate Court it was confirmed stolen from, the will still appeared online and for sale for several weeks. Just last week, it appears that the George Wright document was removed from the Quality Autographs’ website. Boston probate officer Richard Iannella declined comment for this article and directed all inquiries to Detective Steven Blair of the Boston Police Department’s Special Investigations Unit. When contacted, Blair stated he was unable to comment on his investigation into the matter. Shame on Major League Baseball for allowing themselves to be even remotely associated with such distasteful and criminal happenings. Mr. Nash, please keep up the good work to keep this matter public. I’m not a collector of baseball or other sports memorabilia, but have enough experience in the realm of historic collectibles to know how auction houses work (or, at least should work). The statement from the MLB rep speaking of the auction house, “it is extraordinarily difficult to accurately trace the history of ownership, which can date back more than 100 years, for all of the items they auction,” is a total whitewash of the issue. Try to consign an item, especially a manuscript, with an auction house without evidence of authenticity and see how fast they turn you away. If they DO decide to list the item for auction, the level of documentation should be made clear in the auction listing, and priced accordingly. No reputable auction house (at least none that I would ever consider dealing with), should accept a LEGAL DOCUMENT for auction without permission of the individual or estate to whom it pertains or belongs. It doesn’t matter whether it is 100 days old or 100 years old or whether it pertains to a celebrity or sports figure or not. What we have here with MLB and auction houses and collectors is “DON’T ASK, DON’T TELL.” It is also called collusion. For law enforcement, it doesn’t have the historical/political weight or dollar value that say, middle eastern antiquities or old master European paintings have, so it isn’t as important or as politically sensitive. Law enforcement has its limits in budget and manpower and must set priorites. Meanwhile, auction houses and collectors can claim ignorance if discovered, and if not discovered, take the money keep quiet (for years and future auctions). Again, thanks and please continue to keep this matter public.